Your notifications are split between screens, apps, and sites. Put them all in one place, only a clik away! clik removes the hassle of keeping track of your Facebook, Twitter, Email, Foursquare, LinkedIn, StackExchange, and RSS notifications. Any time something pops up, it’s sent directly to all of your cliked devices. Once you check it, it’s gone for good, so you never have to deal with it again. 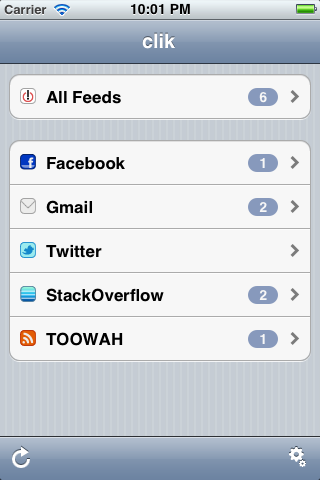 All of your notifications are aggregated from Facebook, Twitter, Email, etc. Your notifications and settings are synced across all of your Mac OS X, iOS, and Android devices. clik can start itself up whenever you log in, so you never miss a thing. Whenever you're on your Mac, clik can stop sending notifications to your mobile. Whenever you leave, clik will start sending to your mobile again. clik is available on the iTunes and Mac App Stores, and the Android Marketplace. clik is presently available at no charge. clik was created by inspyre. Any technical questions regarding clik should be submitted to dev@inspyre.me, and any requests for support may be submitted either at inspyre.me or to support@inspyre.me. Any other questions should be directed to info@inspyre.me. Browse other questions tagged app iphone android mac-os-x ipad .